The southwest Chicago area thrives with the new steam cleaning technology introduced by DetailXPerts. With pristine cars driving throughout the city, the community takes notice of the showroom finish provided by the auto detailing in Chicago. Jason Paganessi, the franchise owner of DetailXPerts of Southwest Chicago, develops excellent relationships with both the commercial and residential communities. As a result, the business continues to grow, expanding due to the limitless customer base. “People notice the quality of the work, but the team that delivers it with the utmost of friendly and helpful professionalism is the key to success,” says Jason reflecting on his time running the business. To celebrate the new business, DetailXPerts of Southwest Chicago will hold a ribbon-cutting event on April 20, 2018. After the first initial opening, the company began offering steam cleaning and auto detailing in Chicago. This event will highlight the official introduction of Jason’s business to the area. Additionally, this is a celebration for over 1,800 vehicles detailed by DetailXPerts of Southwest Chicago in just under a year. Overall, learning to stand out from the competition with innovative, eco-friendly methods allowed Jason to secure valuable business throughout the territory. Due to this, Jason possesses a full schedule of auto detailing in Chicago that includes car dealerships, residential clients, and auto businesses. Working within the area and adapting to what the community needs has helped businesses succeed. However, every city looks for something different with detailing. Understanding the target audience establishes connections and establishes relationships throughout the area. 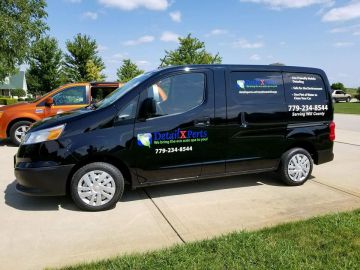 DetailXPerts of Southwest Chicago offers auto detailing, specialty detailing, fleet washing, and other services in Minooka, Shorewood, Channahon, Joliet, Lockport, Homer Glen, New Lenox, and Manhattan. Other lines of service include automobiles, boats, motorcycles, buses, and more. Businesses are welcome to inquire about special rates and long-term relations. You can easily reach them at 779-234-8544 and schedule your free demo.